Cycle or drive 2 kilometres to the 17k long unspoilt fabulous surf at Pakiri Beach from our private green oasis. Enjoy the outdoor living area amongst the raised vegetable gardens, on the new verandah, sipping local wines and enjoying the restful country views. The holiday accommodation is a 100 year old fruit packing shed transformed into an apartment with loft bedroom (queen bed) and separate bedroom with twin beds downstairs. There is full but compact kitchen - antique dining furniture - and mix of contemporary and antique living room pieces. There is contemporary New Zealand paintings and sculpture. The bathroom has grey water systems, solar hot water and dehydrating toilet. Find a shady spot for a picnic on the property or explore the stream looking for eels, and view native revegetation projects. 40 minutes to Mangahwai for more surf, Bennetts for lunch, markets or lagoon swimming. Herman and Annemie - We enjoyed your cosy and beautiful house enormously and also your friendship. Be welcome in Belgium - thanks for everything - we are very grateful. Wendy and Les - A thousand thanks for peaceful respite and hectic, hot Melbourne. We sleep the sleep of the dead in the barn loft and I have to mention the quality of the cotton sheets is suprrb! A wonderful way to start the new year. 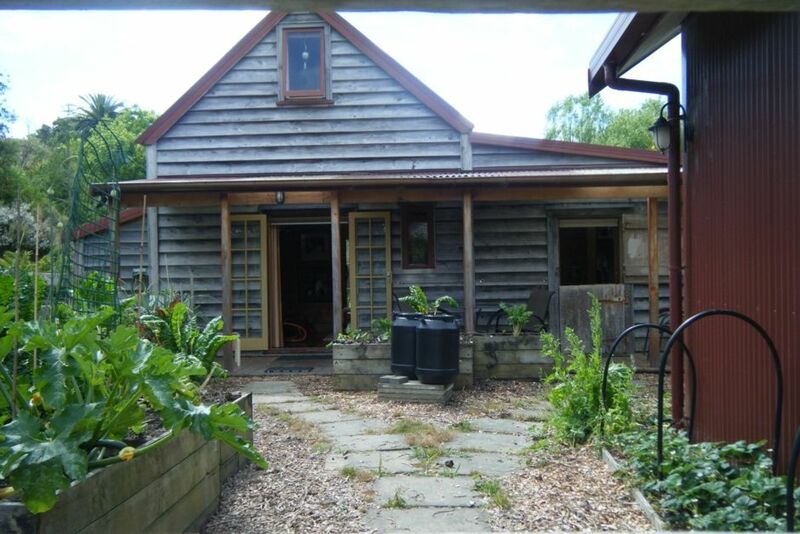 Jane and John , Grey Lynn - What a gorgeous retreat - a rural idyll!. Thanks so much for your hospitality and great food. The barn is so welcoming and comfortable that we instantly felt at home. Alison - California - I love the barn - what a lovely fantasy hideaway. I am likely to be back! Pets allowed with prior approval - cat, chicken and stock friendly only. Lovely hosts,offered help if you want ,but not at all intrusive. Very pretty rural setting.The cottage was gorgeous with leadlight windows and doors, leather chair, and the soft light and wooden features gave it a very relaxed ambience.Lots of books to browse, music CDS to play, board games to amuse us.The comfy beds gave us all a good nights sleep. Short drive to amazing Pakiri beach.We all loved it.Thanks so much Gill and Alan. A great place to stay, close to Goat Island and Pakiri Beach, in a quiet location. Good location as very close to Leigh and Matakana. Lovely cottage; close to the beach and local events. A nice quirky place to stay at away from the city madness but easy enough to get to local town or beaches from there.